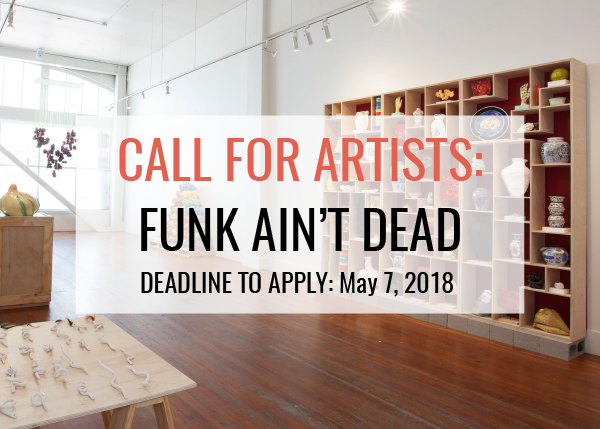 Root Division invites artists working in all media to submit work for Funk Ain’t Dead. Inspired by the original, Funk exhibition presented at the University Art Museum at the University of California, Berkeley in 1967, the themes tackled by those original Bay Area Funk artists remain relevant today. Described as hot, committed, bizarre and sensuous, Funk Art encompasses the colorful, the weird, the politically outraged, the sidewalk scavenger, the hoarder, and the psychedelic. This exhibition celebrates the funky makers still creating in the Bay Area through various mediums. Funk Ain’t Dead reflects on past remnants of the original movement and how this sensibility continues to be championed today. or by submitting a $10 check or money order made payable to Root Division, mailed to: Root Division, Attn: Funk Ain't Dead, 1131 Mission St., San Francisco, CA 94103. Please note that the $10 fee must be on file by May 7, 2018 at 11:59 pm for the email submission to be considered. Artists will be notified about inclusion by May 18th, 2018. Call 415.863.7668 or email Samantha Reynolds, Interim Arts Program Manager at samantha@rootdivision.org with any questions.